How Much Does Glamping Cost Compared to Camping? Glamping or glamorous camping as it’s known is absolutely amazing. It can take you to places that hotels possibly can’t take you. You can have your own secluded little spot where you’re surrounded by the paradise the UK has to offer while experiencing all your home comforts such as a comfy bed, heating, electricity and even en-suite facilities. You can go glamping in Wigwams, yurts, shepherd huts, buses, boats, treehouses, bothys, the list is endless. But how expensive is glamping? For the purposes of this blog we’ll concentrate on Wigwams as it’s what we do best. But isn’t glamping just the same as camping? Yes, it can be but not always. Let’s look at the facilities of camping compared to Wigwams. 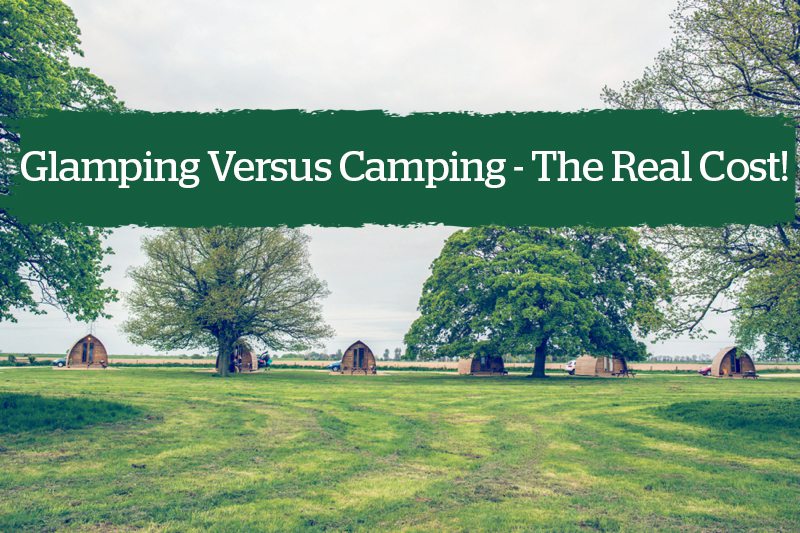 It’s very clear there is a big difference in accommodation between camping and glamping, and there is also a difference between our wee brave/big chief wigwams and our running water wigwams. Obviously to go camping you’ll need to buy your equipment beforehand. So, for a family of 4 we estimate the basic set up cost would be on average £900*. This excludes any luxuries, and no cooking equipment. You can expect to pay on average £25-£30 per night for electric hook up for 2 adults & 2 children. Add your £5 nightly cost for your equipment** to this then you’re looking at £30-£35 for a basic camping set per night. Now, let’s look at a big chief Wigwam. I picked a random site on the Welsh coast, Snowdonia & Coast Wigwams. I looked at their peak season price for their big chief for 2 adults and 2 children. The total price for 1 night is £60 (£50 for 2 adults with £5 per child). So, camping at £35 per night or glamping in a Big Chief at £60, just an extra £25. An extra £25 will get you a fully insulated Wigwam, very comfy beds, darkness when you need it so you aren’t woken up at 6am by the sun and here’s the best bit - NO MIDGES. All the windows and doors are double glazed and close perfectly. The only way a midge is getting in your Wigwam is when your kids leave the doors open! Now let’s compare this to a Running Water Wigwam. This is our fully en-suite Wigwam with sink, toilet and shower and cooking and dining facilities. I chose another Welsh site, Lleyn Peninsula as they currently have brand new running water Wigwams. They charge £80 for 2 adults (children under 16 stay for free). Just an extra £20 per night gets you the same Wigwam luxuries with an en-suite shower, toilet and sink. It also gets you cooking facilities - hob, sink, kettle, toaster, microwave and fridge. This is definitely a luxury that people are starting to expect on a glamping holiday. So, how expensive is glamping? Whilst in the long run savings can be made with camping - it’s a lot more hassle, nowhere near as luxurious and the initial cost is huge. If you’re only going on holiday once or twice a year - it makes a lot of sense to go glamping and save yourself a lot of hassle and keep it a relaxed and enjoyable holiday. To browse our glamping locations, visit our locations page. To discover the Wigwam Experience then click here. If you're just looking for inspiration then visit our Inspire Me page. Electricity and a heater has been included so we can compare it to a Wigwam®. **Therefore nightly cost of camping equipment is approximately £5 per night.